The IBM® System Storage® SAN48B-5 switch is designed to meet the demands of hyper-scale private or hybrid cloud storage environments by delivering Gen 5 Fibre Channel technology and capabilities with 16 Gbps performance that support highly virtualized environments. To enable greater flexibility and investment protection, SAN48B-5 is configurable up to 48 ports and supports speeds up to 16 Gbps in an efficiently designed 1U package. This switch—now enhanced with enterprise connectivity options that add support for IBM FICON® connectivity—can provide a highly reliable infrastructure when used with fast, scalable IBM z Systems™ servers. 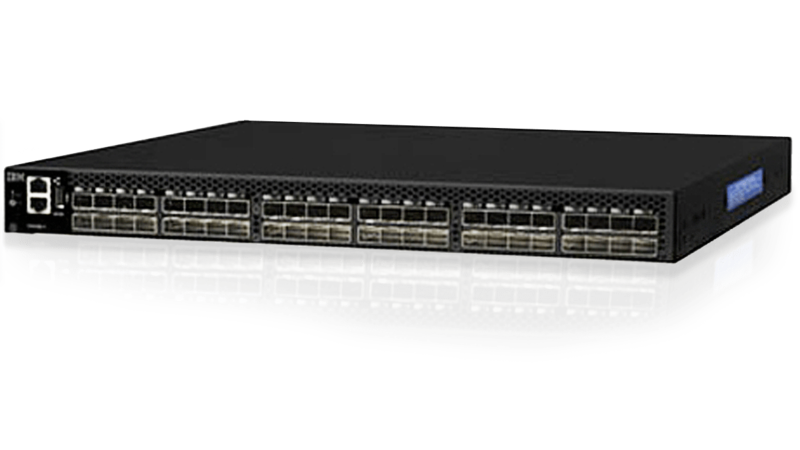 The Gen 5 Fibre Channel switch delivers 16 Gbps performance with up to 48 ports in an energy-efficient, 1U form factor to gain great flexibility for diverse deployment strategies. Help maximize uptime and performance while reducing overall operational expenses with ClearLink diagnostic technology, non-disruptive software upgrades and redundant, hot-pluggable components. Fabric Vision technology simplifies management—for data storage capacity and the network—to help reduce operational costs and optimize application performance.